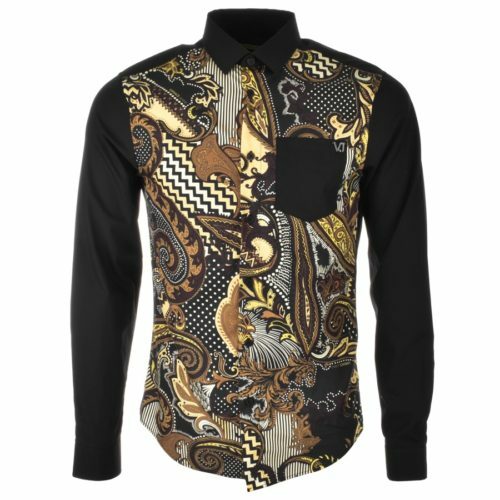 Versace Jeans Long Sleeved Baroque Paisley Shirt In Black, Slim Fit. A full front button fastening with a standard shirt collar and button fastening cuffs on the long sleeves. The front of the shirt features a baroque inspired paisley design in yellow, orange, brown, cream, and black. A pouch pocket is situated on the left of the chest in solid black which features the signature black metal Versace Jeans VJ logo stud. A curved hem design. 100% Cotton. 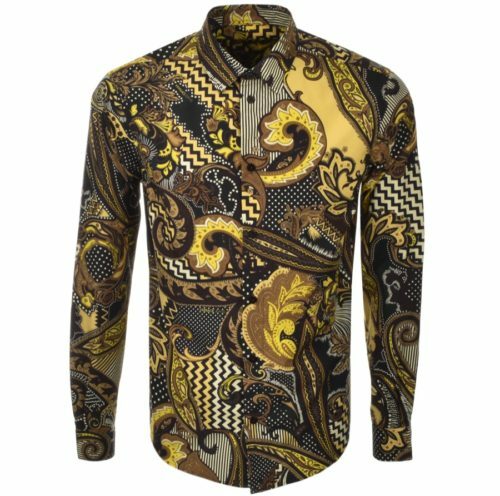 Versace Jeans Long Sleeved Baroque Paisley Shirt In Yellow, Easy Regular Fit. An overall printed Baroque inspired paisley design in yellow, brown, orange, cream, and black. A full front black Versace Jeans button opening with a standard shirt collar and button fastening cuffs on the long sleeves. The signature Versace Jeans logo is featured within the design in yellow.